A 41-year-old Bengali man, who immigrated to the United States during the 1990s, presented with 36 hours of intermittent, colicky abdominal pain, nausea, vomiting, and inability to tolerate PO intake. 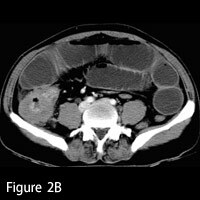 Detailed history revealed a relatively protracted course of abdominal pain, albeit less severe, over the preceding six months. Past medical history was unremarkable, with only mild gastroesophageal reflux and no prior abdominal surgery. Upon physical examination, the patientâ€™s abdomen was distended, tender, and tympanitic. Interestingly, extensive, palpable cervical lymphadenopathy was also appreciated. Laboratory analysis demonstrated an elevated white blood cell count. 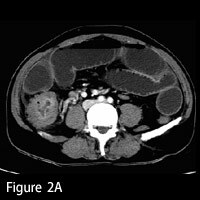 A CT scan of the abdomen/pelvis with IV contrast was performed, followed by colonoscopy. In addition to a right hemicolectomy, a â€œmassâ€‌ arising from the ascending colon was removed and sent for pathologic evaluation. Multiplanar imaging of the abdomen/pelvis demonstrated multiple fluid-filled, dilated loops of small bowel, consistent with obstruction. No free intraperitoneal air or fluid was detected. Within the right lower quadrant, there was transmural, circumferential thickening of the proximal ascending colon and cecum. Prominent enhancement of the colonic mucosa at the point of obstruction was noted. A key finding was concomitant involvement of the terminal ileum. A mild degree of pericolonic and mesenteric fat stranding was visualized, compatible with regional inflammation. Multiple enlarged mesenteric lymph nodes were also appreciated. Tuberculous (TB) infection of the colon is typically acquired by ingesting tracheobronchial secretions in the setting of active pulmonary infection or by ingesting contaminated milk products. Extrapulmonary TB, especially of the gastrointestinal tract, is less common and, in the setting of suggestive imaging findings, still requires a certain degree of suspicion. Transmural involvement of the ileocecal valve region is fairly classic yet not specific for TB colitis. There may be a striking desmoplastic or fibrotic reaction at the site of infection. Occasionally, focal infection can assume a masslike appearance radiologically, heightening concern for malignancy (ie, carcinoma, lymphoma). Mucosal enhancement is generally the rule, with transverse ulceration seen upon endoscopic and pathologic evaluation. Similar to Crohnâ€™s disease, fistulae and sinus tracts may develop secondarily, though less commonly. The differential diagnosis for right colonic and/or ileocecal disease includes Crohnâ€™s disease, TB colitis, neutropenic colitis, Yersinia enterocolitis, amebiasis, and colonic malignancy. Crohnâ€™s disease differs from TB colitis in that bowel loops tend to be separated in the former secondary to fibrofatty proliferation of the mesentery vs. adenopathy with tuberculosis. Entamoeba histolytica, endemic to tropical climates, can induce fulminant colitis of the right colon, occasionally giving the cecum a tapered, conical shape. Similar to colon carcinoma, however, the terminal ileum is often spared with amebiasis. Immunosuppressive states (ie, AIDS, posttransplantation) can incite a neutropenic colitis that also favors the right colon. Yersinia enterocolitica is a known cause of pseudoappendicitis, often presenting with acute terminal ileitis, with relative sparing of the colon; stool cultures and serology are confirmatory. The diagnosis of TB colitis is an important one, since prompt initiation of antibiotics is critical to prevent smoldering infection. After pathologic confirmation in the case described herein, the patient was started on isoniazid, rifampin, pyrazinamide, and ethambutol. Presumptive administration of immunosuppressants (ie, steroids) assuming a diagnosis of inflammatory bowel disease can be a devastating pitfall in management. Generally, TB colitis should be a differential consideration if the aforementioned imaging findings are present and the patient is either a native of or has recently traveled to an endemic country. Exposure to TB should be investigated, though our patient denied that possibility. Confirmation still requires a positive culture for acid-fast bacilli or histological analysis. Despite the lack of pulmonary involvement in our case, the adjunctive finding of cervical adenopathy was certainly a clue to the correct diagnosis. â€” Rahul V. Pawar, MD, is a board-certified diagnostic radiologist completing a fellowship in neuroradiology at New York University Langone Medical Center. Figures 1A and 1B â€” Axial and coronal images show dilated loops of small bowel. Figures 2A and 2B â€” Axial images demonstrate obstructive, focal transmural thickening involving the proximal ascending colon, pericolonic fat stranding, and adjacent adenopathy. 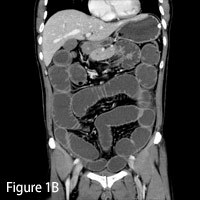 Figure 3 â€” Axial image demonstrates focal â€œmasslikeâ€‌ thickening of the cecum and associated involvement of the terminal ileum. Theoni RF, Cello JP. 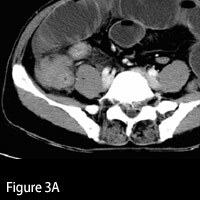 CT imaging of colitis. Radiology. 2006;240:623-638. Vantrappen G, Geboes K, Ponette E. Yersinia enteritis. Med Clin North Am. 1982;66(3):639-653. 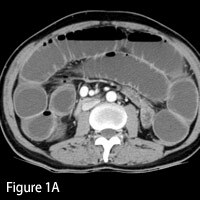 Pereira JM, Madureira AJ, Vieira A, Ramos I. Abdominal tuberculosis: Imaging features. Eur J Radiol. 2005;55(2):173-180.